SUPERB SPACIOUS 9 SEAT MINIBUS WITH A TOW BAR!! NEED FINANCE ? POOR CREDIT WE CAN HELP! JUST ASK ! CLICK THE LINK AND APPLY 24/7! FULL SERV HIST @ 20K 39K 53K 76K & 89K!! FACTORY SAT NAV WITH BLUETOOTH-USB&AUX!! CRUISE CONTROL WITH SPEED LIMITER!! REAR PARKING SENSORS!! 9 SEATS!! 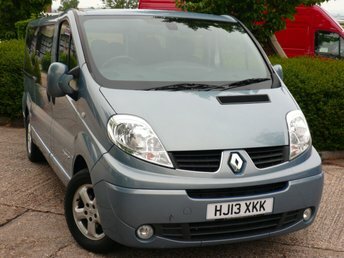 SUPERB SPACIOUS 9 SEAT MINIBUS! NEED FINANCE ? POOR CREDIT WE CAN HELP! JUST ASK ! CLICK THE LINK AND APPLY 24/7! FULL SERVICE HISTORY @ 16K 40K 60K &82K! AIR CONDITIONING!! REAR PARKING SENSORS! Incredibly practical, solidly built and comfortable too, the Renault Trafic van is an award-winning and highly versatile commercial vehicle that has been designed to suit specific business needs. Available in panel van, crew van and passenger models, the Trafic is a real workhorse that won't let you down. 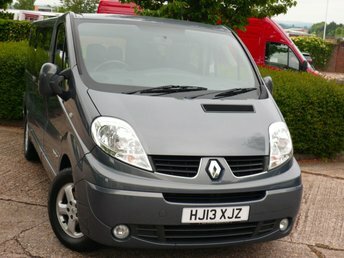 Discover more about the latest range of used Renault Trafic vans for sale in Andover by speaking to a member of the team at Richard Knight Ltd. Our friendly staff members will help you to find the best used van to suit your company's requirements and ensure you secure a great deal. Contact us now to find out more and to arrange a test drive in one of our used Renault Trafic models.